Maun View Summer Fair in Mansfield, Notts. Join us for Family Fun! Thurs 16 Aug from 10am. Everyone welcome! please join us at Maun View on Thursday 16 August from 10am-4pm for a whole day of fun for the whole family. 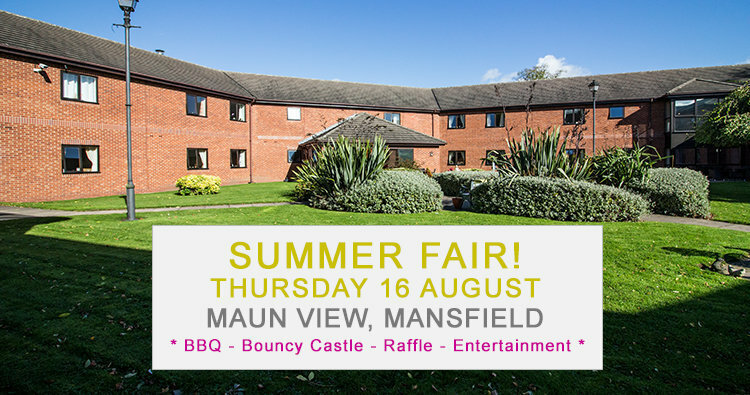 Maun View residential care home in Chesterfield Road South, Mansfield, invites you and your families to come along and enjoy a BBQ, bouncy castle, ice cream van, Shetland pony visit, entertainment, raffle & much more. Meet the hosts; the Maun View professional care team, take a tour of our home and chat with our lovely residents and their relatives – everyone is welcome along. Maun View is a 77 bedroom residential care home situated in Mansfield, twelve miles north of Nottingham, providing expert care for older people, including dementia care and nursing.